TCorp is close to finalising a structural overhaul that has permeated the very foundations of its organisation. 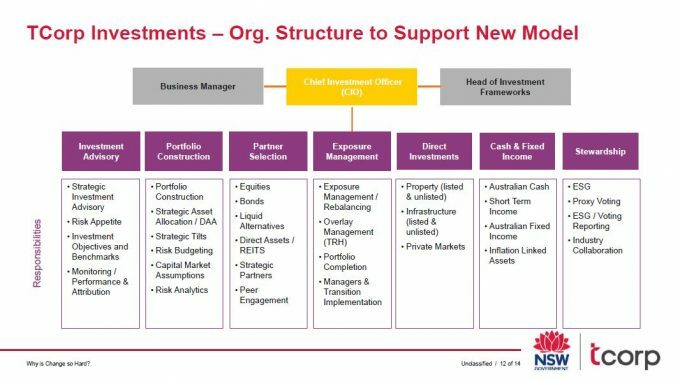 With only a handful of roles still to be filled, the new structure embraces a whole-of-portfolio approach, with portfolio construction at the heart of the investment process. 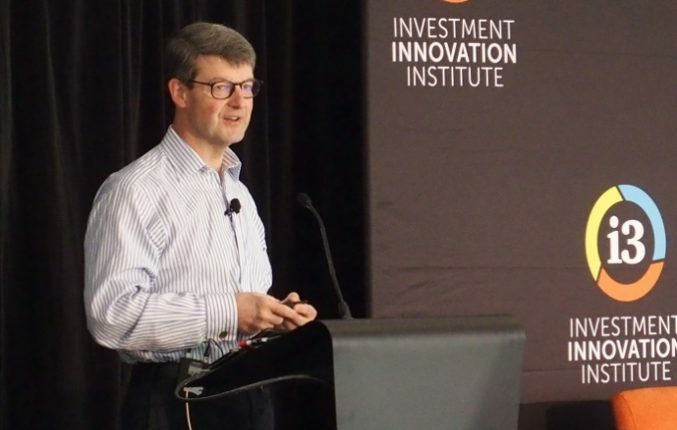 “In doing the original research for this process and visiting a large number of peers around the world, there were some quite confronting realisations,” Stewart Brentnall, Chief Investment Officer of Tcorp, said at the [i3] Asset Allocation Forum in the Hawkesbury Valley last week. This results in a misalignment between the end client’s investment objectives and the time spent on achieving this objective, Brentnall said. “The remaining 80 per cent is allocated to active risk activities whose processes, objectives, measures and incentives bear little relation to the client’s long-term absolute return investment objective,” he says. “In the main, the client wants a real return over rolling long-term periods of ‘x’ per cent. And yet, most of these strategies look at maximising information ratios, have short-term objectives, probably have very high turnover and have human capital incentives that really bear no relation to the inflation-plus target. To ensure the changes would not merely occur on paper, Brentnall set out to get the board to develop a core set of investment beliefs against which all investment decisions would be tested. These beliefs enshrined the fund’s approach to portfolio construction, risk, its comparative advantage, governance and stewardship. “We spent a lot of time taking our board through an exercise of deriving a set of beliefs for themselves, taking our executives through an exercise of designing a nested set of more detailed beliefs that feed into the board beliefs,” Brentnall said. Brentnall wants TCorp to not be just an efficient and well-organised funds management corporation, but also to stack up against any of its global peers. “We are trying to get to best in class. We are trying to operate on a whole-of-portfolio basis and manage a fund in which there is an ongoing and permanent dynamic process where we look at the client’s explicit investment objectives, with a sensible contemporaneous decision-making process where decisions don’t get held up because they all have to go to the board,” he said. “The board only retains the highest-level decisions; almost everything else is delegated to the role that I occupy. We have a board investment committee that provides some very important support and governance around that. Under the new structure, TCorp is split into seven teams, which all report to Brentnall. The teams are investment advisory, portfolio construction, partner selection, exposure management, direct investments, cash and fixed income, and stewardship. Two of these teams are in-house asset management teams. TCorp manages $25 billion in Australian bonds and cash in-house, as well as about $12 billion in direct property and infrastructure under the direct investments banner. Brentall said TCorp has no plans to internalise equities or international fixed income. “We have two internal teams in cash and fixed income, where I think TCorp does have a comparative advantage over the market,” he said. The new structure centres on the investment advisory team, which tries to understand the investment objectives and risk appetite of each of the three main clients: Treasury, State Super and icare. “Our new structure is set up for our multi-client environment, which is why that first team of investment advisory is the central engine room where the majority of those consistent processes will go on,” Brentnall said. Once clear objectives and boundaries have been set, the advisory team passes them on to the portfolio construction team for implementation. Also under the new structure, partner selection is centralised rather than being left to each individual asset class. It will also work more collaboratively with the portfolio construction team. “Portfolio construction is not done independently in equities, bonds and alternatives and other sectors where the sectors don’t talk to each other as much as they should do and the sectors don’t talk to the centre as much as they should do,” Brentnall said. Exposure management is about internalising cash-flow instructions and implementation, while the environmental, social and governance (ESG) team will work across the whole portfolio. “The stewardship and ESG function has an output that is pervasive across everything we do,” Brentnall said. The road is not without obstacles though, Brentnall warned. In preparing the project plan for the amalgamation, he identified a series of pitfalls that could derail the new structure from being embraced by the wider organisation. “Once you get to where we are and you’ve designed a nice little project plan which is very clear about what we want to do, has lots of sheets of paper with charts and time horizons and milestones, then it gets difficult. Why is that?” Brentnall said. First of all you need a clear reason for change, he said. “I called it the problem statement. Quite often you don’t see a clear enough problem statement before a project has even started,” he said. Management also needs to clearly articulate the reasons for change and get staff to buy into the project. “Pretty basic, but you’d be surprised how often that happens and has happened in corporate examples,” Brentnall said. Often projects like these also suffer from a lack of implementation and get stuck at the planning stage. “Talking has to stop and action has to start. This is moving from that project plan on a piece of paper to seeing a well-managed plan that has clear thoughts and clear plans for an actual execution,” Brentnall said. Some change models are not fit for the organisation, so it is important to ensure you’ve got to have the right horse for each course. Some change plans are simply incomplete and lack an end-to-end schedule. “Each step has to be thought of and each dependency both up and downstream needs to be thought about really carefully,” Brentnall said. Finally, the impact of permanent changes are often underestimated and management style and team culture need to adjust. “What does moving on mean? Does it mean we are moving to the new model or does it mean actually we are going back to the old model,” Brentnall said. To prevent this, the executive team and leadership needs to be closely involved in the change program. “Often leaders remain too far removed from the change. Leaders should not delegate to project managers and delivery executives to run, live and advocate a project,” Brentnall said. The amalgamation has created a new entity that manages about $94 billion and once the NSW Generations Fund is seeded, as announced in the recent budget, it will go to $97 billion.